Country music isn’t some chart in a weekly music rag. It isn’t simply a collection of words or imagery that happen to tie however loosely to rural or Western themes. Country music isn’t some eeny meeny miney moe game on the genre wheel where you select whatever pie piece you think will be most advantageous to get you to the top. Country music is a lineage that dates all the way to before recorded music even existed. Every performer who chooses country music as their profession must understand it is their duty to uphold, and preserve, and pay forward those traditions that have lingered for generations into the future, because they know it’s those traditions that have afforded them their opportunities. Sure, some music may talk about horses and Wangler jeans and Gucci hats. Some songs may throw a banjo or a fiddle in the mix. Some may not do any of these things, and still claim affiliation to country music as a lucrative vehicle for launching a career. But true country music doesn’t need to explain itself, or defend against accusation. It just is, and its truth and authenticity is formidable and unquestionable. Otherwise, it is just musical entertainment. Many years from now, legions of country fans will look back on this era in country music with awe and jealousy that us living souls were lucky enough to experience the majesty of “King” George Strait when he was still alive, just like today’s generation looks back with fawning reverence for the faraway legacy of Hank Williams. George Strait’s music won’t whither over time, it will only be embellished by age. His memory won’t fade in the months and years after his passing, it will ascend to a deity-like status in the ethos of country lore. George Strait’s legacy is long, and growing longer by the year. It isn’t without flaw of course, as anyone’s would be after amassing 28 studio records spanning nearly 40 years. But Strait’s early career efforts are as strong as any of the country music greats. His mid career era was expansive and consistent. “King” George’s longevity in country music is nearly unparalleled. But as he entered into the period that all popular country artists do, where it’s a question of whether radio and awards will still pay attention to them, perhaps he got caught in the tug-of-war of two worlds for a while, and found a way forward that was more familiar to pragmatism than it was to purity. It seems strange to characterize George Strait’s latest record Honky Tonk Time Machine as a return to his roots. After all, this is George Strait. 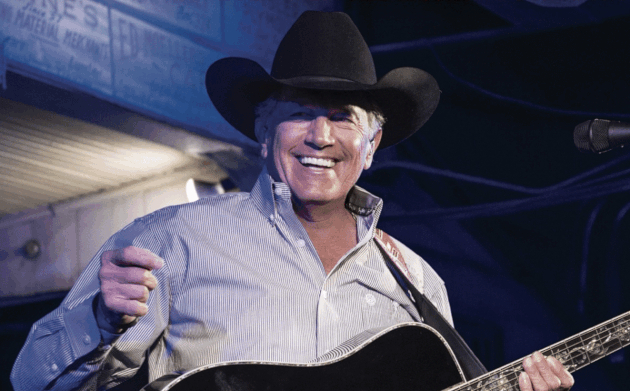 But nonetheless, it’s a fair accreditation to make, and a welcome conclusion to settle upon when you appreciate the authority with which George Strait can deliver a honky tonk heartbreaker, or a barroom boot scooter, which he does on numerous occasions on this new album. Now completely free from having to even consider the commercial implications of his music, George can just be George, and record the music he wants to, the way he wants to. A small but noisy minority of country fans always love to question Strait for writing so few of his own songs. Over the years this is a task Strait’s delegated to the likes of Dean Dillon, Jim Lauderdale, and a good deal of others, while slipping in a few of his own here and there. Sometimes recognizing a good song can almost be just as important as writing one, and that’s been one of Strait’s strong suits over the years. But Honky Tonk Time Machine finds George co-writing eight of the album’s 13 tracks, which has to be a record for him. Some of the songs George wrote with Dean Dillon and son Bubba are the best of the record, including the tear-soaked “Sometimes Love,” a touching, but not sappy tribute to police officers called “The Weight of the Badge,” and one of two heavily religious songs on the record, “What Goes Up” co-written with Bubba and Jeff Hyde. George isn’t afraid to evoke Jesus on this record, which may leave some of the secular persuasion skipping over certain tracks. But no matter your opinions on the presence of a higher power, the line “Come hell or high water, there’s still two things worth saving, God and country music” should get you nodding in approval, at least if you like to linger around this corner of the internet. Honky Tonk Time Machine could possibly have benefited from cutting off a couple of the songs. Nothing wrong with “Código” on the surface, but if we’re going to give it to Maren Morris for turning a Target commercial into a song, we can’t spare George Strait for peddling his boutique tequila company in a jingle track passed off as just another album tune. And even though it is very cool to finally hear fellow Texans George Strait and Willie Nelson singing on the same track, you’ll be hard pressed to find another song so full of shoddy phrases, strained rhymes, and sloppy harmonies than “Sing One With Willie,” however fun it might be. They just needed to spend a bit more time on this one to make it more memorable than novelty. 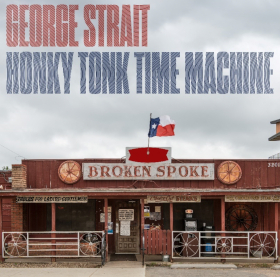 But you still get everything you want out of a George Strait record in Honky Tonk Time Machine, from some great mid tempo stuff that’s perfect for Saturday night, along with few serious tear jerkers, to the point where you don’t feel uncomfortable telling people you believe this might be one of Strait’s better efforts in the latter half of his career. Amen and sing forever George. No better showman out there! What, no love for Jeff Hyde on the “What Goes Up” co-writing credits? Odie Blackmon and Johnny Paycheck weren’t mentioned either. Sometimes songwriters and studio players come up in the narrative flow of a review, sometimes they don’t. No disrespect was meant. Yeah, sometimes songwriters come up organically, like when you mention the song and credit the songwriters, except either due to bias or oversight, it reads as if you’re miscrediting “what goes up” to Dean Dillon as a cowriter with Bubba and George. That’s not the way I was reading it, but just to alleviate any silly drama here, I just went in and added Jeff Hyde’s name to the review. Also, I published a dedicated article on this record that ran down all the songwriting credits that can be read below. I appreciate that folks want songwriters recognized, and I want to recognize songwriters as well. But in the context of a review, sometimes naming songwriters off one by one for each song just gets real clunky. That’s what liner notes and album announcement articles are for. So I’m like, “Who the hell is Jeff Hyde?” I looked him up thinking I’m in the dark about some up and coming Texas songwriter …. he wrote a handful of songs for Eric Church singles. It would have been a distraction to add his name to the review because everyone would have to stop and look him up. Conway and George Strait never did it this way awwwwww nawwwwww. What’s everyone’s favorite George Strait album? I agree with Honkytonkville. I wouldn’t argue with “Somewhere down in Texas” either. You could easily make a killer “NON #1 Greatest Hits” compilation. So many awesome and underappreciated songs. Which song, of the same name, is better? Somewhere Down in Texas – George Strait or Somewhere Down in Texas – Jason Boland and the Stragglers. The rays of light through my Shiner Bock bottle make me want to turn the key and put down the throttle. The real question is…which “She’ll Leave You With a Smile” do you prefer? The one on “Carrying Your Love With Me” or the one on “The Road Less Traveled”? ‘Livin’ It Up’ … there’s not a skipped track on that album. Does Fort Worth ever cross your mind for some reason is by far favorite. You seriously can’t go wrong with any of his 80’s albums. They’re all fantastic from front-to-back. But if I absolutely had to choose one album, I’d have to say Strait from the Heart. Blue Clear Sky. It was my first of his so there’s some sentimental value but Blue Clear Sky, Carried Away, and I Can Still Make Cheyenne are gems. I can still make Cheyenne is so such an amazing song. Everything just works so well. I love Honky Tonk Time Machine. It’s definitely one of my favorites. Just about anything from the 80’s and 90’s stuff was solid also. I can say Love is Everything is my least favorite from him. Gonna chime in with ‘ Chill of an Early Fall’ from 91. Was released the day I was born. My dad told me I was probably conceived to a George Strait song. Great review. While obviously Codigo is simply a commercial for a product, it’s very well done, and I enjoy the song quite a bit. I do wish Sing One with Willie was more genuine and not just a novelty song, but that’s really my only complaint regarding the album. There’s not a single track that I don’t enjoy to some degree, and many, including the title cut, Every Little Honky Tonk Bar, and Take Me Away are magnificent. I truly think this is Strait’s best album through-and-through since his self-titled album (George Strait) in 2000. George is so much “The Man”. I listened to the CD a couple of times on Saturday in the car and I felt transported back to the 90s when George was still cranking out hits. I’ve never understood why people give George crap about not writing his own songs. Elvis didn’t write his own songs. Sinatra didn’t write his own songs. All three of these guys were/are great musical artists who interpret the words of others in music. A lot of songwriters can’t sing. So just because some writers can’t sing, their songs should never be heard? That’s some nonsense. Not his best album (Ocean Front Property) & not my album of the year (so far Danny Burns with North Country). You know what you get when you buy/stream a George Strait album & there is no reason for a change. “Some Nights” sounds like a (radio-)hit & is my highlight together with “What Goes Up”. On “Old Violin” George Strait sounds like Conway Twitty. As for my favorite George Strait album: “Lead On” or “Easy Come Easy Go.” “It Just Comes Natural” is up there, too. That’s the guy that played Drew in the Teardrops On My Guitar video. lmao. Tyler Hilton like from One Tree Hill Tyler Hilton? I must play this album immediately. I have to agree with this review. I listened to it on my way home from work last night and there isn’t one song I felt compelled to skip through. I second that emotion (re: Danny Burns AOTY so far, with Joshua Ray Walker as co-frontrunner). Trigger, why do you always write “King” in quotation marks when it’s an attribute of George Strait? Is it something along the lines of John 19:21? Or because of Bob Wills? I have been loving this record and have listened to it a bunch of times over the weekend. It will definitely get routine play from me! The flaw on the record for me is.. I love that George & Willie teamed up on a song but I don’t actually like the song (the lyrics). I want an actual song not some song blowing smoke up each other’s butts about how they always wanted to sing with each other & now they are. Definitely has the “We waited 40 years for this?” feel to it. I agree. It seems like a precursor to an actual song. They basically just made a song about wanting to sing a song with each other. I expected more. Besides being form Texas, what the lubbock do they have in common? Willie is a progressive, pot-smoking hippie; George is Bush-loving, strait-laced rodeo man. There’s a reason they never crossed paths. This is just a check off their bucket list. For Willie, furthering his lead in the Guineess World Record for duet partners. So, just because they don’t agree politically means they can’t want to do a musical collaboration? No, because I love them both equally (maybe Willie a little more). But creatively they are polar opposites. Strait’s all business-like and despite “Murder on Music Row” has benefited and defined the Nashville machine. Willie’s approach has always been outside the lines and free. I’m surprised they sound as good as they do on this song! I never would have thought of putting George and Willie together. Their styles seem so different. Of course, Willie has teamed up with Julio Iglesias, Ray Charles, and Wynton Marsalis among many others, so I guess it’s not so strange. The two of them together seems kind of like a novelty, so why not a novelty song? “Two More Wishes” — is that a Jim Lauderdale composition (or co-write)? It sounds like one. “Some Nights” should have been the lead single (if there is such a thing anymore). That sounds like a radio hit. But, I’m not sure Strait and Co. are chasing radio anymore. There are some all too familiar spots on this record I haven’t warmed up to yet … “Sometimes Love” and “Take Me Away” to name a couple culprits. This is one of Strait’s better efforts of late. I think it will be a great study to compare this with Reba’s new album to see how two great statesmen (woman) approach the twighlight of their careers. A lot of talk about “returning to their roots;” for Strait, I think he’s just doing what he does best, not pushing any envelopes or challenging himself. Absence makes the heart grow fonder – that’s the secret recipe for the buzz around Honky Tonk Time Machine. Jim Lauderdale and Odie Blackmon. Texas wealth. I get the necessity of putting on the chef’s hat and serving up Texas gallantry to the ladies who are buying, but I like George best when he’s hanging with the guys. Wish there was more of that on this record, but in the age of snap tracks and club beats, I’ll take George any day of the week and twice on Sundays. My main thoughts on the album are that it’s exactly what you’d expect (and want) a George Strait album to be. There’s nothing groundbreaking or game-changing here. There are few if any surprises. And sometimes, that’s a good thing. It’s just good, honest, traditional country music. At the end of the year, if it makes a Top 10 list, it will be for that reason: for its simplicity. I really enjoyed this album. I prefer this one over his previous album “Cold Beer Conversation”. Any chance of you doing a review on Midlands new single “Mr. Lonely”? I got my CD Friday and I have listened to day an night. It’s a great CD . PS I have on my You tube account plus a lot of others of his. He is the Greatest. I missed him in Atlanta.. This is a good album. Solid. Not great, but all things considered … George sounds really good, given how much he seems to be struggling with his voice at times live. This is a good album. King George rarely disappoints. Just saw him at the Houston Rodeo. Damn good show. Another great CD is A Road less traveled. The song RUN is great!!! Love this album, but then again I’ve never not loved a Strait album. I don’t know how many he has left, but he seems to be finishing strong. I loved Cold Beer Conversation and this was a great follow up. George will never go out of style. I can tell he still can sing well, but the damned auto-tune is so unnecessary and makes George sound robotic. Let the man sing. He doesn’t need the vocal manipulation. I agree with many Some Nights is my favorite but I love the whole album. It reminds me of why I love country music. My favorite Strait album is probably Strait from the Heart. It is so hard to pick just one. Pure Country is also timeless. Hey Trigger, by any chance does famous YouTuber Grady Smith work for this website as a writer? Or are you Grady Smith??? People on social media are thinking the 2 of you are connected as co workers or are the same person. You started this website in 2008. Grady would have been 19 years old then… It’s very possible. Plus it’s like a monopoly, you have this website and now a successful YouTube channel. But u act like you are different people..like Hannah Montana. That dude couldn’t/shouldn’t work for SCM he’s garbage. I’m pretty sure they are the same person. They have the same writing styles. I know little to nothing about albums- that’s not to say I haven’t bought any or not listened to them but it’s not how I rate my listening (outside of Mickey Newbury’s SanFrancisco Mabel Joy) but the rest of your comment hit the nail on the head! Totally agree with you Fuzz. ……”Many years from now, legions of country fans will look back on this era in country music with awe and jealousy that us living souls were lucky enough to experience the majesty of “King” George Strait when he was still alive, just like today’s generation looks back with fawning reverence for the faraway legacy of Hank Williams. George Strait’s music won’t whither over time, it will only be embellished by age. His memory won’t fade in the months and years after his passing, it will ascend to a deity-like status in the ethos of country lore.”….. This paragraph really caught me off guard. I’ve got most of George’s albums, but he’s clearly highly overrated from a talent standpoint. With the possible exceptions of Garth Brooks and Johnny Cash, nobody has had more success, with less talent, than George Strait. Also, all you neophytes need to get your crap straight. Roy Acuff is the King. Huh- I thought Bob Wills was still the king. And I thought Hank Hill was the king. I can agree with this. He has/is head and shoulders above so many. What a voice. Try not to be so emotional. Overrated doesn’t necessarily mean crappy. I’ve got most of his albums; I like his music. I’ll be “that guy” and agree with this. I don’t get the love for George. I’m in that loud minority described in the article – he doesn’t write his songs, that kills it for me. So he didn’t “have” 60 number ones, he just sang them. If you aren’t writing (most of) the songs, what makes you different than any pop star that doesn’t write their own songs. What really is the difference between George Strait and, say, Britney Spears? Good performers who are attractive and can sing. Like Trigger said, I think Strait is more analagous to Sinatra or Elvis than Britney Spears, but I get where you’re coming from. There are a lot of artists that I respect more than George Strait due to the fact that they wrote their own songs, but singing a song that you didn’t personally write doesn’t detract from how good the song itself is. Tons of big country artists didn’t write most of their music. Even Waylon Jennings, outlaw country incarnate, mostly sang other writers’ songs. That’s fair, those are probably better comparisons. I agree that it doesn’t matter who wrote a good song, and if you want to do a couple covers or a couple songs per album you didn’t write, then I’m fine with that. It hurts the connection I have with the artist if they didn’t write the song, though, personally. I totally get that, dude. As someone that listens to far more “alt” country or “underground” country than the (new) mainstream stuff, all my favorite artists write their own songs. That being said, George Strait’s 80s output is just straight up fantastic country music. He starts losing me in the 90s, and there’s very little in the 2000s that I care for, but the first decade of his career is full to the brim with great stuff. For the most part, I agree about songwriting being the most difficult and important part of the art form, but there is art in the performance and interpretation, as well. Exceptional singers and performers can take a song and make it great through their interpretation. I love Guy Clark, but I would much rather hear Jerry Jeff Walker’s version of LA Freeway than Guy Clark’s. Ditto just about everything Bob Dylan has ever written. I’d rather hear a middle school choir sing it. I don’t disagree, and I hope I don’t come across as thinking he has no talent, or that just anyone can do it. I like plenty of his songs. I just can’t hold him in as high of regard as most others seem to. The songwriting is just part of it, but I’m saying that even as a vocalist, he is just average. There is nothing spectacular about his voice. Basically, he’s just a handsome cowboy, with an average, pleasant voice, who found a crap-ton of good songs to sing. Dumb. Did the other King George write (most of) his own songs? Definitely agree, and while were at, for controversies sake, lets throw in Miranda Lambert and dare I say it, Willie and Waylon. Funny, there all from Texas just like George. As a singer, Dwight Yoakam is still grossly underrated. His control is incredible. The song, “Last in Love”, from Pure Country, is one of George’s most beautiful vocal performances, and one of the best ever in any genre, IMHO. So subtle, smooth, and gorgeous! Commercial or not, I still like Código. Trigger, looking forward to your review of the new Reba album, given that you’ve already said that some of the cuts equal her career best. With George and a return-to-roots Reba, it’s a good time to be a traditional-leaning contemporary country fan. I’ve never understood all the critique of George Strait. He puts out solid, easy-listening, fun-to-sing-along-with songs. That’s what I want from country music and he has delivered it for 40 years. He caters to his fans, not his critics. Good for him, and us. You gotta have a tortured soul and not know whether you wanna be country or rock to impress most of this sites readers. Excellent piece, Trigger. Superbly written as well as a fair and accurate take on the man and his career. Long live the King! I’ve been lucky enough to “experience the majesty of King George” not only on recording and radio but over 30 times in concert. Please never again talk about him “passing” I don’t think I could handle it. I love this album; George’s best since “Troubadour”, I think (and I seem to be more positive regarding his 2000s output than some on here–80s, 90s, or 00s, George is always great). A couple songs that don’t appeal to me just yet, but sometimes those are slow burners that get you later on, so we’ll see. All in all, a stellar record. Hope a song or two hits on radio, but not gonna hold my breath. What’s your favourite George album Herr Trig? “Strait From The Heart” has always been my go-to, just because I think it’s the best cover-to-cover album, though some of my favorite Strait songs are from other records.